Grease splatters in the kitchen, crayon streaks on the walls, and dirt and grime on your electronics are all powerless against the magic of these almighty sponges. Although the capabilities of the Magic Eraser look like magic indeed, its power comes from a special material. These foam-like sponges are made of a porous melamine material that gets into hard-to-clean surfaces and tiny grooves. All it takes is a dab of water to moisten the Magic Eraser; no other cleaning chemicals are needed for the magic to happen. The key to its stain-fighting properties is in its water-activated micro scrubbers. It will blow you away when you learn in how many ways you can use this little tool. 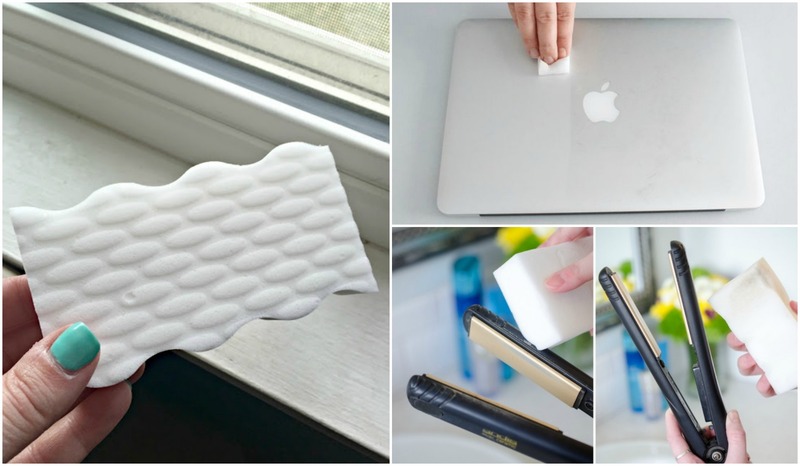 Once you start implementing these hacks in your daily life, you’ll wonder how you were able to live without the Magic Eraser before! Whether you want to erase the tag off a plastic food container or the guest’s name off a wine glass, Magic Eraser is one of the most effective ways to remove permanent marker from plastic or glass. You can easily get a magic eraser here ! Have a cute glass bottle that you want to reuse in your kitchen? This magical sponge will help you get rid of glue residue on the glass. Windowsills are infamous for gathering dirt and dust. And because they’re usually painted white, you’ll see it all the more. But a magic eraser will get that grime out in no time. If you want to make your laptop clean again, the Magic Eraser definitely comes in handy. This method also works on phones and other gadgets. The inside of the oven glass is the hardest thing to clean in the kitchen! You can spend hours scrubbing, and it still doesn’t look good at all. When nothing else works, try the Magic Eraser! It turns out, it can fix that disgusting oven door with no chemicals! Silver gets tarnished and loses its shine. If you don’t have much time to polish your silver jewelry or utensils, simply use the Magic Eraser. If you have a pair of shoes that you absolutely love and can wear just about anywhere, eventually they get old and dirty. The Magic Eraser will help renew and clean those shoes. Your flat iron (a.k.a. the hair straightener) gets really dirty form all the hair products you use. If you want to clean it, just wet the eraser, wipe down the flat iron, and all the grease, gunk, and hair product goes away! This miracle sponge will also help you remove the scuffs, pen marks, and dirt build up on leather so that your couches, shoes, purses and luggage can look like new again. We all know how hard it is to remove that cooked-on food from the side of the microwave. But thankfully it doesn’t have to be a chore when using the Magic Eraser. Turns out that you can actually remove stains with the magic eraser! No need to quickly throw your favorite top in the wash and have it shrink or lose color. Cleaning your house may not be the most pleasant task but once you have the right tools and tricks under your belt, it becomes a lot easier. The Magic Eraser is one of those little tools that can be super effective at cleaning the stuff that looks almost impossible to clean. Implement these 10 hacks and watch how much more exciting your cleaning routine will get!